The global managed services market was valued at USD 155.91 billion in 2017, and is expected to reach USD 296.38 by 2023, witnessing a CAGR of 11.32% during the forecast period, 2018-2023. The global managed services market is expected to witness keen interest in information services and managed mobility. There has been a shift in focus toward managed services and their applications for both short- and long-term strategic decisions. As managed services enable a company to access enhanced applications and services that could not be possible in-house, it helps them to target their core strategic area, while outsourcing the rest of the tasks to the service providers who possess the operational expertise in that domain. Managed services adoption also helps in controlling the ongoing expenditure, along with the sharing of risks of new technology with a third-party service provider. One of the most significant benefits that it provides is the economies of scale that help the companies to cut down their costs. There has been an increase in capital expenditure for cloud and managed services by small and medium enterprises, and this is expected to drive the market over the forecast period. One of the major challenges faced by the small and medium businesses is a limited IT budget. Every decision related to spending is linked with a cost benefit analysis. Expenditures with higher returns are always given priority over others. However, every business needs technology to grow to keep up with the competition. Hence, managed services play a critical role in providing cutting-edge technology to their clients. Small businesses can further benefit by avoiding the need for hiring personnel to manage the IT infrastructure. The MSP is expected to have a team of skilled personnel who will take care of the problems associated with the maintenance and upgradation of the infrastructure, thus eliminating expenses, such as salaries and training costs. 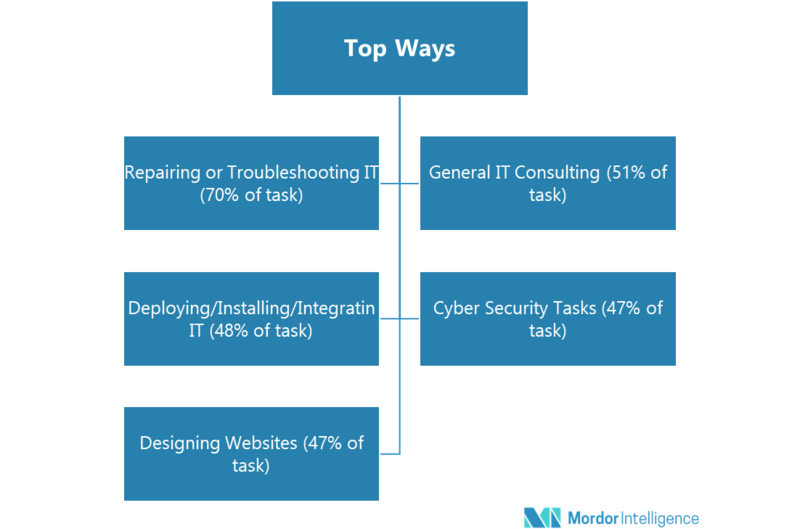 Due to these advantages offered by managed services, hiring an MSP effectively improves the functioning of an organization with reduced costs. The cost of hiring skilled personnel for various purposes (apart from core business) can be eliminated, thus making the investment worthwhile, especially for small and medium-sized enterprises. The use of businesses to shift their IT financing model from capex to opex, in order to align their requirement to reduce cost, is also driving the market for managed services. An increasing threat of data theft and cybercrimes has compelled the organizations to opt for advanced services that can deliver monitoring and management of security assets, detection and prevention, and threat intelligence research. Rising security threats, regulatory compliance, and fear of data breaches are expected to continue to drive security investments across various industries. Small and medium Enterprises (SMEs) are increasingly embracing the BYOD policy, which demands various security software to protect corporate data among different devices. Different industry verticals, such as Banking, Financial Services & Insurance (BFSI), retail, IT & telecom, manufacturing, aerospace & defense, healthcare, and others, use cyber security solutions, like managed security to protect their data. However, large enterprises were the main targets for cyber criminals, who are constantly looking to exploit technological vulnerabilities. 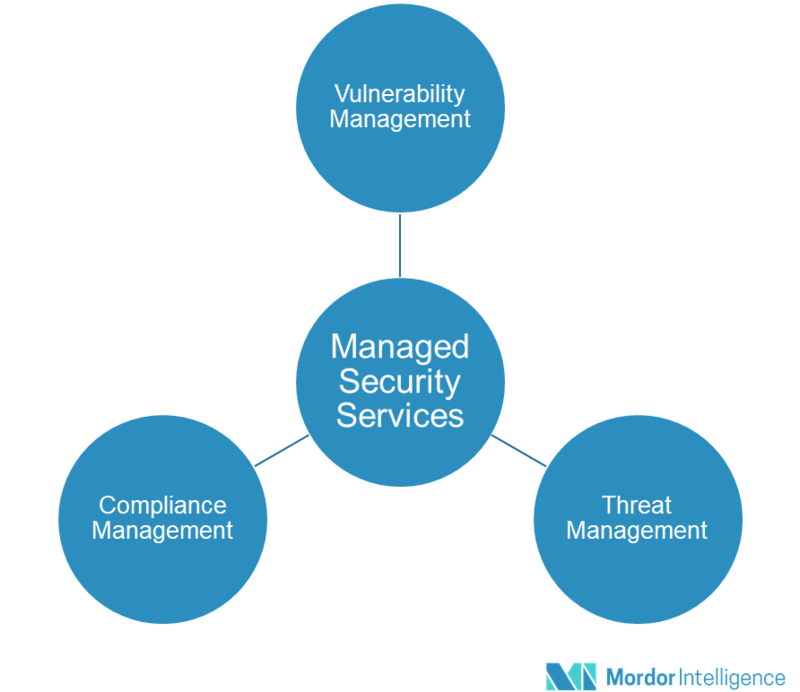 This value proposition has been compelling to drive the demand of managed security services, especially from large enterprises. In the near future, growing integration of biometric sensors in security-based applications, coupled with threat intelligence sharing to counter advanced attacks, is expected to boost the growth of the managed security services market, thereby contributing to the growth of the global managed services market. The market for global managed services is largely dominated by North America, followed by Europe. There has been an increase in customer expectation that has enhanced the product portfolio of the service providers. This has further increased the competition in the market, with several companies chipping into the competition through advanced tools and interfaces, along with pay-per-use model. Managed services have a significant potential across the North American region as they facilitate the offerings of critical services at a low cost. Companies are focused on expanding their businesses with the help of third-party services, which provides mobility to the business. Among the various types, managed data center and managed infrastructure are expected to gain significant traction during the forecast period. Increasing adoption of BYOD policy across sectors has resulted in the increase in demand for managed services across North America. Growing demand for workforce mobility and enterprise agility has fuelled the demand in this region. Advancement in mobility services, big data, and computing, are also driving the adoption of managed services in this region. September 2017 - Wipro became the official technology partner to McLaren Technology Group to help drive digitalization across its businesses. With this partnership Wipro is expected to help McLaren achieve its defined IT strategy. February 2017 - IBM acquired Agile 3 Solutions, a software company that created security analytics dashboard, enabling C-suite executives with limited technical knowledge to understand security alerts.